Today, as all Australians must be aware, is Sheila's Day. That is because Sheila is merely the Irish equivalent of Cecilia, which is the female equivalent of Cecil, which ultimately derives from the Latin caecus, which meant blind. Anyway, today is St Cecilia's day, and St Cecilia is the matron saint of music. Thus this day is devoted to the muses. Sheila (as I like to call her) only obtained this honour through a misunderstanding. She was a martyr of some sort in the second or third centuries, and an early account of her death said that she was stifled by being locked in her bathroom which was then overheated with air from red hot pipes, or candentibus organis. This seems to have been misread as cantatibus organis, which meant she was stifled while the organ played. In a dying, dying fall. But the best are the closing lines of John Dryden's , which given his usual mediocrity is a miracle attributable only to the intervention of a saint. And here is the whole Auden poem set to music by Benjamin Britten. P.S. St Cecilia's body is, allegedly, in a church in Trastevere which I visited a couple of months ago. I would have knelt and prayed but somebody was playing the organ very, very badly, and it quite put me off. It may well be the day of the Muses, but I can't think of a damn thing to say. Thank you Inky Fool!! 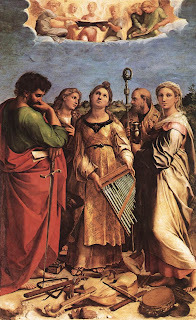 St Cecilia is my confirmation saint and now she's my matron as well because I'm studying music - opera singing to be precise. I too have been to the church in Trastevere. Her body is supposedly incorrupt, I think I read that somewhere? Also: "music shall untune the sky" must be one of the most beautiful sentences I've ever heard! Cecilia, you're breaking my heart, you're shaking my confidence daily. And of course she does return (the song being evidence) but there's no guarantee she stays for long. Fickle, just like a muse should be. Classical music is one of life's greatest gifts. Only bestowed on some of us, but we know that we're incredibly lucky! Cecily.